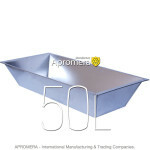 Galvanised feeding trough 50 Liters. Galvanized water tank ideal planter. Could be used inside or outside. This Galvanised feeding trough makes a sizeable feature – be it as a garden planter or a shop display item. This unusual planter would look great either in a traditional or contemporary garden setting. 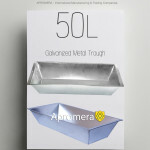 Our galvanized metal trough are 100% waterproof and made for chic & practical home decor. We produce Galvanized Metal trough of steel with a thickness of 0.40 to 0.50 mm. Such production is considered to be a standard quality. It is more resistant to deformation and outside influences.